An upgrade that will look good sitting on your kitchen counter and will offer some new options for brewing espresso and coffee at home. Like previous Verismo brewers 583 and 600 (discontinued) the Verismo V offers the option of brewing an espresso or brewed coffee at the touch of a button. The V keeps many of the same features that we saw with old models: a 19 bar pump pressure, auto off, removable and adjustable drip tray and a place to store used pods. However, the removable water tank is now more than twice the size – 77.7 ounces (compared to 33.8 ounces on previous models) which is fantastic. Buttons are placed on top for easy coffee controls and they do offer some extra options including hot water on demand and programmable cup volumes. The 11” tall and 7.6” wide is beautifully designed and it will definitely look good sitting on a kitchen counter. 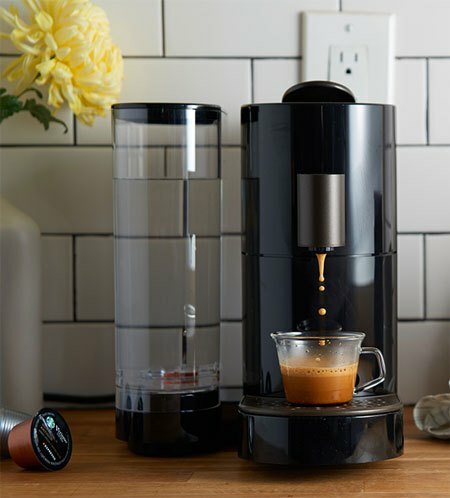 Verismo V brewer is available in black and retails for $149.00. The machine includes a limited one-year warranty for normal home use, a free box of Verismo pods and free shipping. Brewing your morning cup with V is simple. The machine uses standard Verismo coffee pods and works just like your old brewer. To brew an espresso, lift the handle, insert one Verismo espresso pod of your choice, close and press espresso pod button. When done, simply lift the handle to send an empty pod into the bin and that’s it. The machine automatically sends the used pod to the bin so you don’t have to do any cleaning. To brew coffee, take one brewed coffee pod and peel off pressure tab at the bottom of the pod. Insert the pod in the machine, close the handle and choose brewed pod button (large cup). The machine will brew a 10 ounce cup. The auto off will activate after 5 minutes to help save energy. This model allows you to set a desired cup volume. The default espresso size is 1 ounce, but you can set it up to 1.5 ounces. The default brew size for coffee is now 10 ounces (on older models that was 7 ounces) and you can change it within 7 – 10 oz range. You can also set volume for milk pods and hot water. For detailed instructions on how to use or setup your brewer, please check your manual or download a copy of Verismo V manual online. The rinse cycle: When you turn on your machine, the machine will remind you to run a rinse cycle. Rinse cycle is necessary to make sure that machine is properly heated, but it also helps keep your machine clean. To rinse, place a cup under the drip nozzle and press a rinse button. After rinsing, your Verismo will be ready to make drinks. You will need to rinse the machine every time it is turned on. As I mentioned, the V machine uses standard Verismo coffee pods. There are over 15 different Verismo pod options, including espresso, brewed coffee, tea and milk pods. For recipe ideas & inspiration, check out this post. Unfortunately, they still don’t have reusable Verismo pods. There are however, foil seals for Verismo pod type available to purchase online. A 100ct foil pack retails for $15.99. They do require more work but it a good option if you want to use your own coffee in Verismo machine. Can you use other pods in Verismo V machine? Can you use k-cups in Verismo V? Can you use Nespresso pods in Verismo machine? The CBTL capsules and Verismo system? Keurig k-cups and Nespresso pods are not compatible with any of the Verismo machines. That includes k-cups, k-mugs, k-carafes, classic Nespresso pods and VertuoLine Nespresso pods. You can’t use any of these in the Verismo machine. However, the CBTL pods will probably work just fine like with previous models. Price: $7.00 for 10ct and $11.00 for 16ct box. That’s $0.68-$0.70 per capsule. But don’t forget, manufacturers recommend using only original pods. Using different pods can sometimes cause a damage to the machine. This rarely happens, but let’s say that original pods/capsules are always the best option. Use other pod options at your own risk. Milk pods: You might consider buying a milk frother and use fresh milk instead. After some time, your Verismo machine can develop sour smell because of the milk pods. With espresso machines, it’s really important to clean all the parts that come in contact with milk, after each use. The problem with Verismo is that milk goes through an entire unit and you simply can’t clean it properly. That’s why I suggest to avoid using milk pods in your machine from the beginning, if possible. It’s important to mention that Verismo milk pods have not been discontinued and you can still purchase them at Starbucks retail locations in case you prefer that option. Where to buy Verismo pods? Starbucks has decided to close their online store. The best place to buy Verismo pods at this time is Amazon and Bed, Bath and Beyond. The pods are also available for purchase at Starbucks retail locations. Verismo vs Keurig: Keurig offers a huge choice of k-cups – at a better price. You can get k-cups for less than 50¢ per cup. They have a huge variety of flavors, brands, roasts, decaf options plus, a reusable k-cup, so you can use your own coffee. The 2.0 system can also do a carafe. While Keurig makes only regular coffee, Verismo makes both: brewed coffee and espresso. Verismo vs Nespresso VertuoLine: Both machines can do coffee and espresso, they have automatic pod disposal and bin storage, and have programmable volume option. Nespresso offers a slightly better machine quality and makes better crema. It also allows you to program the desired water volume for from 0.3 oz to 17 oz – with Verismo that’s 1 oz to 7 oz range. The pod price is pretty much the same but since you sometimes need two Verismo pods to brew a decent cup size, Nespresso pods will cost less total. Verismo V retails for $149.00 ($179.00 for machine and frother bundle), but you can get Vertuoline at similar price when on sale. Here you can read a full Nespresso VertuoLine to get more information. Difference between Verismo 580, 583, 600 and V: Verismo V is definitely the best Verismo model so far. The water tank is more than doubled, buttons are place on top, it has programmable cup sizes and hot water on demand. Few small improvements but, they offer much better user experience. All Starbucks Verismo machines include a limited one-year warranty for normal home use. Customer service help is available Monday – Friday, 6 a.m. – 3 p.m. , at 1-800-334-5553 and 1-877-421-9062. To keep your Verismo in good shape, clean the external parts of the brewer with wet cloth regularly and descale it every three months. Here’s a detailed guide on how to clean your Verismo machine properly. The Verismo V brewer is available for purchase at Starbucks stores and Amazon. My Verismo coffee brewing button will flash red as it is brewing a cup of coffee. I googled this and it says the machine was overheated and to just shut it down, unplug it and give it another go. It has been like this for almost a week now! We RELY on this machine. We had the 600 before this and bought the V about a month ago. Any tips? Hi Melanie, on old Verismo models the red button was a protection from overheating. On the new model, Verismo V, if the button starts to blink red while brewing the brewer needs to be descaled. Please try descaling your machine. If the button doesn’t stop blinking after descaling or it stays red all the time, please contact Starbucks customer service at 1-800-334-5553. My Verisimo will only brew a small bit into my cup then the rest of it goes into the pod resivoir. I don’t think it is puncturing my pod all the way and I have cleaned it several times and it still keeps doing this. Or it will only make a 1/4 of a cup and then just stop? I have done every trouble shoot option available and it still keeps doing the same thing? please use a measuring cup to test how much water is dispensed at specific cup setting. You don’t have to insert the pod, just press the buttons to see how much water the machine will dispense. Test both, espresso and brewed coffee button. The default cup size for espresso is 1 ounce. I know it seems like a really small amount, but if the machine dispenses 1 ounce, it’s working fine (that equals to one single espresso shot). The default size for brewed coffee is 10 ounces. If you get 1 ounce and 10 ounces the machine is working fine. In that case, the only thing you can do is to set espresso to brew 1.5 ounce if you want. To do that, press espresso button for 3 seconds, release and when the water reaches a desired level, press button again. The new setting will be saved. The maximum setting for espresso is 1.5 ounce. You can’t do this for brewed coffee because the 10 ounce is its max setting. If the brewed coffee button isn’t brewing a default 10 ounce but smaller, use button to move the default size to 10 ounces. Like for espresso, press brewed coffee button for 3 seconds, release, wait until it reaches 10 oz, and press button again. Maybe it’s set to smaller cup size for some reason (you can also use a factory reset option for this purpose if you find it easier). If both cup options are set to maximum, and you’re still getting cup sizes smaller than recommended, then something is definitely wrong with the machine and I recommend to call Starbucks customer service. I will give it a try thank you! My Verismo doesn’t stop when I pick the brewed coffee option. It would brew the whole tank if I let it. Do you know how to fix this? Will you ever make it to make hot chocolate pods? Hi Sara, I’m not sure when and if the hot chocolate Verismo pods will be available. If you want, you can send it as an idea to Starbucks or you can contact Starbucks customer service directly and check if they plan to make these pods soon. Thank you.